Dhardo Rimpoche (1917-1990) was said by Tibetan Buddhists to be an incarnation, or tulku, of the chief abbot of Losel-ling College at Drepung Monastery, located in central Tibet. 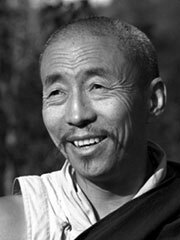 He was the second tulku in the Gelug lineage and eleventh in the Nyingma lineage. Dhardo Rimpoche was educated in the traditional Tibetan monastic style, taking his Lharampa Degree (Doctor of Philosophy) at Drepung Monastery, and doing further study at Gyud-med Tantric College. In 1951 he was appointed abbot of the Tibetan monastery at Bodh Gaya, and then in 1954 moved to Kalimpong near the India-Tibet border. Kalimpong was to become an important staging post for Tibetans fleeing the Chinese invasion. Dhardo Rimpoche founded an orphanage and school for Tibetan refugees, which he named the Indo-Tibetan Buddhist Cultural Institute (ITBCI), and was abbot of Yiga Choeling Monastery, Ghoom. During the 1950s and 1960s Dhardo Rimpoche was friend and teacher to Sangharakshita, an English Buddhist who spent 14 years based in Kalimpong before returning to England to found the the Western Buddhist Order». Friends of the Western Buddhist Order (FWBO). Sangharakshita considered Dhardo Rimpoche to be a living bodhisattva, and he is still revered in the FWBO. In the 1980s the FWBO’s charity Aid For India (now known as the Karuna Trust) undertook to provide funding for the ITBCI. Portions of Dhardo Rimpoche’s relics, the ashes from his cremation, have been installed in several stupas in the West: at Sudarshanaloka Retreat Centre (near Thames, New Zealand), at Padmaloka Buddhist Retreat Centre (near Norwich, England), at Guhyaloka Retreat Centre, (near Alicante, Spain), and at Tiratanaloka Retreat Centre in Wales. Dhardo Rimpoche’s motto was: «Cherish the doctrine; live united; radiate love». He was concerned especially to teach the children at his school that «actions have consequences». The Third Dhardo Tulku, Tenzin Legshad Wangdi, was born in 1991.